I first heard about pattern matching and the importance it has in medical diagnosis over 30 years ago. A friend of mine who was in medical school at the time told me about one of his professors who was always interested in the Augenblick diagnosis or the diagnosis that could be arrived at in the blink of an eye. He gave me examples of several diagnoses that could be either made immediately or within minutes based on a set of features that would lead to immediate associations in the mind of the clinician without an extensive evaluation. I had many encounters in my medical training with the same phenomenon. I can recall being on the Infectious Disease consult team and being asked to see a patient with ascites for the possible diagnosis and treatment of spontaneous bacterial peritonitis. The consultant with an expert in Streptococcal infections and after patiently listening to the resident's presentation he asked what we thought of the rash on the patient's leg. The patient had lower extremity edema with a slightly erythematous hue and a slight exudate in areas. What was the diagnosis? Without skipping a beat the consultant said this was streptococcal cellulitis and suggested sending a sample to the lab for confirmation. It was subsequently confirmed and treated. Why was the attending physician able to hone in on and diagnose this rash when it escaped the detection of two Medicine residents and two medical students? He was an Infectious Disease specialist and that may have biased him in that direction but is there something else? One of the ways that physicians and probably all classes of diagnosticians arrive at Augenblick diagnoses or efficiently clump and sort through larger amounts of information faster is by pattern matching. Pattern matching is also the reason why clinical training is necessary to become an adequate diagnostician. That will not happen with rote learning alone. It is one thing to read about heart sounds and actually experience them and to have that skill refined by listening to hundreds and thousands of normal hearts and hearts with varying degrees of pathology. Rashes are classic examples and several studies have documented that the speed and accuracy with which dermatologists can make an accurate diagnosis of a rash is much higher than the average physician. In pattern matching a recognizable feature of the patient's illness triggers an immediate association with the physicians experiences from the past leading to a facilitated diagnosis. In this case we have a very practical problem of a patient with known bipolar disorder and a question of whether or not they have had a stroke. 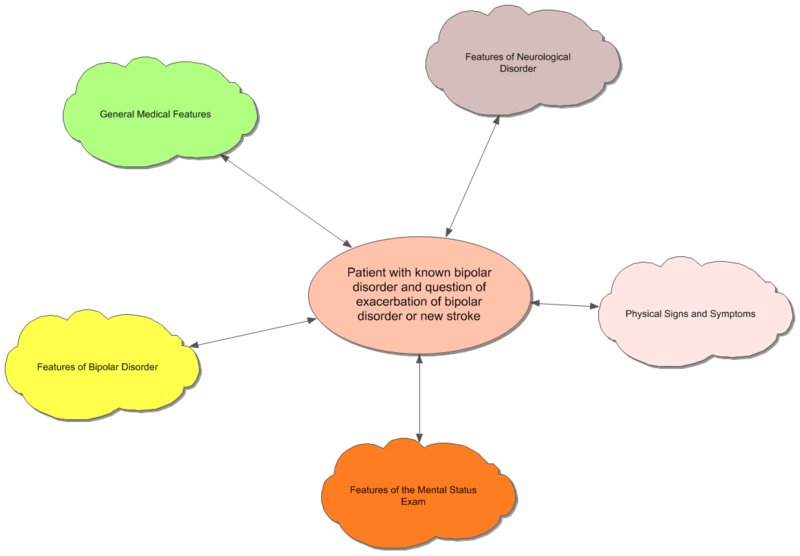 In this case the respective clouds (there are many more) represent collection of features of medical diagnoses that may be relevant to the case. Unlike a textbook, these features represent a lot of varied information including actual events and nonverbal information like the clinicians past history of diagnosing strokes and caring for people who have had strokes. Each cloud here can contain hundreds or tens of thousands of these features. These features are unique aspects of the clinician conscious state and the only way to control for variability between clinicians is to assure that physicians in the same speciality have similar exposure to these experiences in their training. Even in the ideal situation where all specialists have an identical exposure to the same illness there will be variability based on different levels of ability and other capacities. An example would be a Medicine resident I worked with whose examination of the heart with a stethoscope predicted the echocardiogram results. It became kind of a joke on our team at the time that all he had to do was hold his stethoscope in the air in a patient's room and it was as good as an ultrasound. For the purpose of this discussion consider that our patient B is a 60 year old woman with a 35 year history of known bipolar disorder. She has known her psychiatrist for years. One day the husband calls with the concern that the patient seems to have developed a problem with communication. She seems to be talking in her usual voice but he can't comprehend what she is saying. She does not appear to be manic or depressed. The psychiatrist listens to the patient on the phone and concludes that she has a fluent aphasia and recommends that they take her to the emergency department as soon as possible. Ongoing care requires that the psychiatrist talk with the emergency department physician and hospitalist to make sure that acute stroke is high in their differential diagnosis and eventually go in to the hospital and examine the patient to confirm the diagnosis. 1. Psychiatric diagnosis is a much more dynamic process than rote learning from a diagnostic manual. The average clinician should have many more features of diagnoses than are listed in any manual. 2. Psychiatric diagnosis requires medical training. 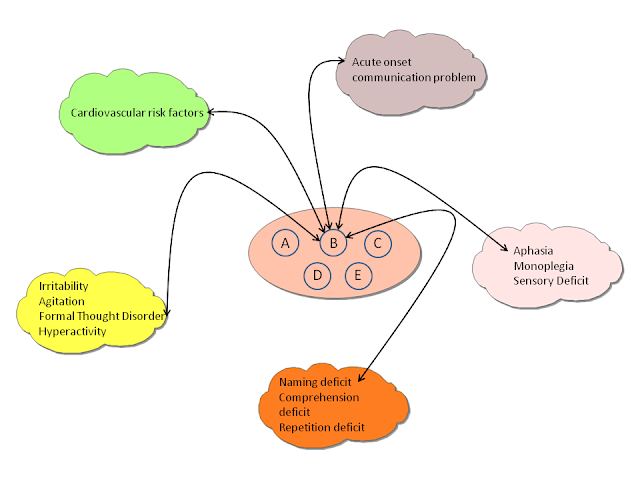 There is no way that our psychiatrist in the example could have made the diagnosis of aphasia and remain involved in the diagnostic process to its conclusion without medical training and previous exposures to these scenarios. 3. The training implications of these scenarios are not often made explicit. Every medical student, resident and practicing physician needs to be exposed to a diverse population of patients with problems in their area of expertise in order to develop a pattern matching capability. They can also benefit by asking attending clinicians about how they made rapid diagnoses, but at that level of training the question is not obvious. 4. Removing physicians with these capabilities from the diagnostic loop reduces the capability of that loop. The best example I can continue to think of is the primary care process where the diagnosis and ongoing treatment of depression or anxiety depends on the results of a checklist that the patient completes in less than 5 minutes. This assumes that there is an entity out there called depression that is based purely on a verbal description and pattern matching is not required. It actually assumes that there is a population of people with this affliction. Despite all of the hype about how this is "measurement based care" - I don't think that a single person like that exists. 5. Pattern matching blurs the line between objective and subjective. There is often much confusion about this line. Are there "objective criteria" that can be written in a manual somewhere that captures even the basic essence of diagnosing a stroke in a patient with bipolar disorder? Is there an "objective" checklist out there somewhere that can capture the problem? Obviously not. For some reason people tend to equate "subjective" with "bad" or "unscientific". In the example given and any similar example, the subjective state with the most experience diagnosing strokes is probably the "best" diagnostician - subjective or not. An "objective" rating scale doesn't stand a chance. So consider pattern matching to be an important but unspoken part of the diagnostic process. For obvious reasons it is more important than diagnostic criteria in a manual. The most obvious of these reasons is that you really cannot practice medicine without it. Clark A. Microcognition. London, A Bradford Book, 1991. I was inspired by a post by Massimo Pugliucci on his excellent philosophy blog Rationally Speaking, to start using concept mapping software to describe some of the things that psychiatrists do and rarely get credit for. There is the associated problem (as I have posted here many times) of checklists being seen as the equivalent of a psychiatric diagnosis. That has been carried to the extreme that some have said rating scales are actual "measurements" or validating markers of psychiatric diagnosis. Any cursory inspection of the combination of parallel and sequential processes that actually occur during an interview will demonstrate that is not remotely accurate. 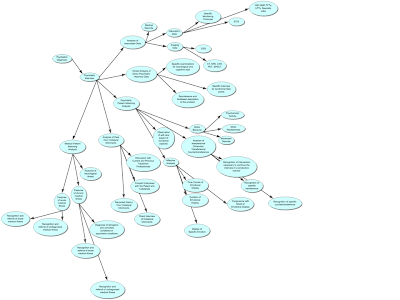 Click on this link for the actual concept map. A click on the diagram will zoom it for viewing. Another click will zoom out. Navigate by mouse wheel or scroll bars. It should print out onto one standard sheet of paper in a landscape view. I am interested in feedback from psychiatrists on what aspects they would modify. If you have suggestions about what should be modified post them in the comments section or send me an e-mail. The concept map may also be useful for explaining some findings that are commonly held up as "problems" with the diagnosis such as low reliability. A common ( and purely hypothetical) example would be the 35 year old patient with a clear diagnosis of depression as a teenager, no history of remission of symptoms and multiple antidepressant trials who develops a polysubstance dependence (alcohol, cocaine, heroin) problem who is being seen in various states of withdrawal for the treatment of depression, insomnia and suicidal ideation. At this point does the patient have major depression, dysthymia, substance induced depression, or depression due to withdrawal symptoms? What would tell you more about this patient's problems - a psychiatric diagnosis or a PHQ-9 score? What would be more helpful in developing a treatment plan? This answer to that question is the difference between medical quality and a term that is frequently substituted by governments and managed care companies. That term is "value". Governments and managed care companies apparently believe that giving someone an antidepressant medication for a PHQ-9 score is a better value than a psychiatric evaluation. Is the FDA objective enough to assess treatments in psychiatry - or is this just politics as usual? The American Psychiatric Association (APA) feed posted a link to this FDA news release regarding a new biological test for Attention Deficit Hyperactivity disorder. The device is essentially a quantitative EEG (QEEG) machine. The QEEG heyday was back in the mid 1980s to 1990's. Devices were designed that could take the standard output of an EEG montage and look at the frequency bands and how that activity fluctuated topographically within the individual. There were two major manufacturers at the time and both of those technologies allowed for a comparison of the subjects QEEG with a standardized groups. The difference could be determined as a t or z score and that was plotted relative to the electrode placements. The final analysis would yield maps consisting of frequencies and mathematical operations on those frequencies. There were several articles on this methodology including an impressive article in Science on the diagnostic capabilities of these instruments. One manufacturer provided an algorithm of clinical features and EEG features that purported to diagnose major psychiatric disorders. You could actually analyze the data both ways - with or without the clinical features. There was enthusiasm to the point that a new psychiatric subspecialty in electrophysiology was made to meet the requirements of psychiatrists who wanted to use QEEG technology. In 1988, I was so impressed with the technology that I approached a potential employer and struck a bargain that I would take a salary cut if they would buy me the machine and the deal was struck. I was fortunate enough to be affiliated with a certified electrophysiology lab with an outstanding electrophysiologist and EEG technologists. This was critical in order to collect standardized data and select numerous 2 second epochs of EEG data for computerized analysis. The epochs had to be completely free of artifact in order to provide valid data for analysis and anywhere from 30 to 60 of these epochs needed to be selected per patient. If you think about it for more than a few minutes, what is wrong with the idea that EEG frequencies should point to a specific psychiatric diagnosis? The short answer is a lack of specificity. There are literally hundreds of conditions that can lead to fast or slow frequencies including normal fluctuations of conscious states. During my QEEG work we had to collect EEG epochs for analysis in the "eyes closed but alert" state. Quantitative EEGs can demonstrate significant fluctuation in that state. After several hundred QEEGs with and without the computerized algorithm, it was apparent that the diagnostic abilities of QEEG were low. There were literally a handful of analyses that seemed to match the clinical diagnosis and at that point we shut down the project. As far as I can tell from their web site, that company no longer sells a QEEG machine claiming to make psychiatric diagnoses. "In support of the de novo petition, the manufacturer submitted data including a clinical study that evaluated 275 children and adolescents ranging from 6 to 17 years old with attention or behavioral concerns. Clinicians evaluated all 275 patients using the NEBA System and using standard diagnostic protocols, including the Diagnostic and Statistical Manual of Mental Disorders IV Text Revision(DSM-IV-TR) criteria, behavioral questionnaires, behavioral and IQ testing, and physical exams to determine if the patient had ADHD. An independent group of ADHD experts reviewed these data and arrived at a consensus diagnosis regarding whether the research subject met clinical criteria for ADHD or another condition. The study results showed that the use of the NEBA System aided clinicians in making a more accurate diagnosis of ADHD when used in conjunction with a clinical assessment for ADHD, compared with doing the clinical assessment alone." From ClinicalTrials.gov that appears to be this registered clinical trial. No results are reported and there are no publications in peer reviewed journals that I can find. The concerns about this technology should be apparent from the history outlined in the above narrative and the same application suggested by the FDA. This is not a diagnostic procedure but one that is a supplement to the clinical evaluation for ADHD. It reminds me what Russell Barkley - noted ADHD expert and scholar said in a seminar I attended last fall. There are no gold standard tests for ADHD any more than there are for any other problems of executive function. He pointed out that hours of neuropsychological testing (he is a neuropsychologist) is no more accurate than standard ADHD checklists. Neuropsychological testing is important because of the high prevalence of learning disorders in ADHD. My prediction at this point (pending an actual published research paper) is that this QEEG machine will not be that clinically useful and if it is a question of neuropsychological testing versus the QEEG, neuropsych testing should be the the option because it can detect and allow for treatment planning for any associated learning disorders and QEEG cannot. One of the risks here in an age where insurance companies deny diagnostic costs is that neuropsychological testing is denied and the QEEG substituted depending on cost. That would not allow for the recognition or treatment planning for a learning disorder. The larger question is how competent the FDA is to make decisions on devices for psychiatric disorders? The FDA came out with a notice in 2011 that electroconvulsive therapy devices may need to be reclassified (Class II to Class III) resulting in the need for additional testing, clinical trials, and regulation. That occurred after two generations of psychiatrists were trained on the current devices and have clinically demonstrated that it is a safe, effective and in many cases life saving therapy. They completed their own study and meta-analyses and it is unclear to me what they concluded. I consider the FDA web site to essentially be unnavigable. Available information in the psychiatric literature suggests that they are still is the process of coming up with a formula for reclassification of ECT devices to a more restrictive category and that their analysis of the efficacy of ECT may have been seriously underestimated. The concern of the authors is that reclassification will restrict availability of ECT to patients who have clear indications for its use much in the same way that poor Medicare reimbursement restricts the availability in some hospitals now. The even larger question is there some kind of systematic bias operating here? Both the ECT and QEEG decisions seem mismatched with the available science and clinical experience. The FDA has the appearance of transparency, but you can never find what you need in the thousands of web pages that are linked to the agency. In the ECT example, I could not find a clear statement, vote or conclusion about the ECT decision until I read the article by Weiner, at al. In the case of the QEEG device there is no publication of the study supporting its use. Independent review suggests that there have been no advances in the past 16 years. FDA Executive Summary. Meeting to Discuss the Classification of Electroconvulsive Therapy (ECT) Devices. January 27-28, 2011. Weiner R, Lisanby SH, Husain MM, Morales OG, Maixner DF, Hall SE, Beeghly J,Greden JF; National Network of Depression Centers. Electroconvulsive therapy device classification: response to FDA advisory panel hearing and recommendations. J Clin Psychiatry. 2013 Jan;74(1):38-42. doi:10.4088/JCP.12cs08260. PubMed PMID: 23419224. Sand T, Bjørk MH, Vaaler AE. Is EEG a useful test in adult psychiatry? Tidsskr Nor Laegeforen. 2013 Jun 11;133(11):1200-1204. English, Norwegian. PubMed PMID: 23759782. Nuwer M. Assessment of digital EEG, quantitative EEG, and EEG brain mapping: report of the American Academy of Neurology and the American Clinical Neurophysiology Society. Neurology. 1997 Jul;49(1):277-92. Review. PubMed PMID: 9222209. 1. Be a physician first - anyone coming for an evaluation needs to be assessed from a triage perspective. Most American Psychiatric Association (APA) guidelines emphasize the need to assess the psychiatric parameters of acuity such as suicidal ideation and aggressive ideation and the risk of those behaviors, but there is very little medical guidance. Psychiatrists need to be able to rapidly recognize both acute medical illness and medical illness that is causing the psychiatric presentation. They need to be able to rapidly assess medical problems that may interfere with the treatment of the psychiatric disorder. The best way to have those skills is to have adequate exposure to the full range of medical problems that can be encountered, especially from a pattern matching and pattern completion perspective. That occurs only from treating many people with variations on the problem. That starts in Medical School where every prospective psychiatrist should be focused on those experiences. 2. Interpret your own studies - that means actually taking a look at actual brain scans, ECGs, lab tests, and other reports relevant to the care of your patients. Psychiatrists need to be actively involved in the medical aspects of the care their patients, especially when they know more about the problems than the other physicians on the scene. A few examples would be in the area of drug interactions, movement disorders, toxic syndromes like neuroleptic malignant syndrome and serotonin syndrome, the evaluation of delirium, electrocardiogram effects of psychiatric medications, and drug intoxication and withdrawal syndromes. 3. Communicate well with the patient and their family. Psychiatrists are trained and observed extensively in interviewing techniques. They should understand the limits of specific interview situations and they should have well developed therapeutic neutrality that other physicians do not necessarily have. In that environment they should be able to have the most productive dialogue with the patient and their family. Psychiatrists should be experts in a diagnostic process that includes information from multiple sources. Psychiatrists are also schooled in the concept of a therapeutic alliance and the implications of that orientation in treatment. 4. Recognize the importance of psychotherapy. Many diagnostic sessions require that psychotherapeutic interventions to be woven into that interview to support the patient, alleviate acute anxiety and to allow for a more thorough diagnosis. Careful approaches to the diagnosis and treatment of patients requires recognition of the fact that some people will not tolerate any medications and psychotherapy may be the only available modality. I do not hesitate to tell patients after an assessment that psychotherapy may be the best approach to the problem as well as discuss non medical approaches that have documented efficacy. 5. Perform an actual psychiatric diagnosis. This task is critical in the training of psychiatrists there is a lack of understanding about what making a diagnosis actually means. Contrary practically everything that you read in the media, checking off criteria in the DSM 5 is not a psychiatric diagnosis. Rating scales are also not psychiatric diagnoses and they are not quantitative measures. It is very common these days for a psychiatrist to see a patient who carries 4 or 5 misdiagnoses like Bipolar Disorder/Major Depression + Attention Deficit-Hyperactivity Disorder + Intermittent Explosive Disorder + Asperger's Syndrome. These folks are frequently on medications that are supposed to address the various disorders and they may not have ANY of the disorders. In some cases they may not require medical treatment. There are many people out there making complicated psychiatric diagnoses and initiating treatment in a 20 minute visit who are not qualified to make these diagnoses. The other line of demarcation is the impact that a disorder has on the patient. People who are functioning well in all spheres of their lives, by DSM definition - do not have a psychiatric disorder. Many people are relieved to hear that they do not have a diagnosis or if they have had a diagnosis in the past that they no longer require treatment. That diagnosis should be more comprehensive than a list of diagnoses. There should be a formulation that describes the phenomenology and potential etiologies of the current disorder(s). A narrative that makes sense to the psychiatrist and the patient. At the end of my diagnostic session with the patient, I will frequently state it out loud in order to let the person know what I am thinking and get their feedback on my formulation. I think that there is inherent flexibility in these formulations because the psychological etiologies can still vary based on the model that seems most applicable or the model that the psychiatrist prefers to use. As an example it could be psychodynamic, behavioral, interpersonal, or existential. It may employ a more recent model like one based on third generation behavior therapy or be a more supportive model focused on bolstering the patient's defenses. The formulation is part history but also a discussion of etiologies (biological, social, psychological), dynamics, and defensive patterns. The formulation can provide convergent validation for the diagnoses. It provides both a pathway to understand the patient and guide psychological interventions. The bulk of the material for this assessment occurs in parallel with the discussion of symptoms. 6. Know the literature on borderland syndromes. There is a significant overlap between medical conditions that are fairly non-specific in terms of diagnosis and treatment response like chronic fatigue syndrome, fibromyalgia, and chronic pain. There are a significant number of people who present to medical and surgical clinics with symptoms and they never receive a diagnosis or an explanation for those symptoms. Familiarity with these syndromes will greatly assist in the diagnosis and treatment of these individuals if they are referred for psychiatric evaluation. Specific knowledge of these conditions will allow the psychiatrist to consider an effective approach and effective patient education. 7. Don't compromise your process because of extraneous variables. The largest extraneous variable these days is the intrusion of business into the practice of medicine. Psychiatrists may find that they are subject to limitations that do not apply to other physicians. As an example, I have been told (by a managed care company reviewer) that psychiatrists don't diagnose or treat delirium when I was the only physician capable of making the diagnosis. If you assess the patient and believe they need further diagnostic procedures or a medication trial that may be diagnostic do not give in to a case manager or pharmacy benefit manager who refuses to authorize what you need. Make sure you communicate what you think the best possible care is to the patient rather than what the business people think. Don't confuse medical quality with what a managed care company is calling "value". They are probably unrelated. 8. In the case of children, the best diagnostic approach looks at the family process both initially and in an ongoing manner. The family should see the psychiatrist as someone who is not only an interested observer, but someone who can offer good advice right from the start of the process and recognize that symptoms in the identified patient can be a product of family dynamics. 9. Take enough time. The only valid way to make a diagnosis is to see the patient and interact with them in such a way that they feel understood. Anything that takes away from that process can negatively impact on the flow of information and the task of providing that person with the best possible diagnosis and treatment plan. The patient in this situation should not have the same experience they would have in primary care clinic discussing their depression or anxiety symptoms and the most obvious difference should be the total time spent talking with the patient. 10. Review your findings thoroughly with the patient and family members if they are involved. The process of psychiatric diagnosis differs from typical medical or surgical evaluations because of the sheer amount of data involved. As an example, it might typically involve a sleep history similar to what might be obtained in a sleep lab with an additional 200 data points to look at the major diagnostic categories. Even at that point there may be constraints on the data in terms of accuracy or detail that require corroboration of active debate. 11. Know your diagnostic thought process - there a number of biases in the diagnostic process that have been written about in the literature on diagnostic decision making and in some journal features like the excellent series in the New England Journal of Medicine. If you know the heuristics involved you can prevent diagnostic errors. 12. Consult with your colleagues - consultation with colleagues serves a couple of useful purposes. No matter how industrious you are it is impossible to see every possible presentation of every possible illness. When you discuss patient presentations with colleagues who are also treating patients you are in effect extending your own pattern matching capability to include what your colleagues have seen and treated. In many cases your colleagues have diagnostic and treatment experience with very low volume illnesses that are ordinarily seen a few times in the course of a career. These are a few ideas I wanted to post today and there are a lot more. Many of them seem like common sense, but the diagnostic approach to mental illness as practiced in most medical settings these days is anything but common sense. You cannot get a comprehensive evaluation and diagnosis in ten minutes and you cannot really be walking out of a clinic with multiple prescriptions for medications that are supposed to work for that diagnosis in ten minutes. The latest reality based media event has been the George Zimmerman trial. Zimmerman shot and killed Trayvon Martin and most media outlets have reviewed the details of the case including courtroom reenactments of the physical confrontation that resulted in the shooting. The secondary story is how the public will react to a verdict. A tertiary story that is building at this time is media criticism - has the media gone to far and should there be cameras in the courtroom? My point is not to reconstruct the arguments of case but to speculate about how unnecessary violent confrontations may occur in the first place. They do occur frequently and the majority of those confrontations are not covered by the press. You might read about them in your local newspaper or if you are a health professional you have probably encountered the victims or the combatants. In my experience, the level of violence and the resulting injuries are always surprising. People are punched in the face or head and die instantly. People are struck or pushed and strike their heads on the way to the ground and die. People are severely beaten on the street for either a trivial reason or the victims of gang violence and die or sustain disabling injuries. Weapons are used against friends and family. It is as if people think that you can engage in Hollywood style mayhem and in the end only the bad guys suffer. The idea that the human body, especially the brain is extremely vulnerable and needs to be protected seems to be suspended. But that in itself is not the root cause of the problem. In reviewing some of the smaller pacifist pastoral societies, Keeley cites their low population density as well as their strong moral distaste for violence (p 31) as a likely reason that the Semai could return to a peaceful existence after being recruited by the British to fight against Communist insurgents in the 1950s. In his chapter "Crying Havoc-The Question of Causes", Keeley takes a fairly detailed look at how war starts as a combination of psychological and political factors starting off with a conflict between two villages where one village owed the other village a debt. He demonstrates how that that conflict escalates to the point of violence and death for several reasons. He cites prestige, theft, adultery, and poaching as common reasons for conflicts with aggression resulting in death. He concludes that the specific information from an archaeological standpoint is generally difficult to discern and considers broader contexts. I think the implicit strength of Keeley's work is that he does have a lot of information on warfare and conflict in small and large societies and through all of that information the common thread is that humans resort to violence as a way to resolve conflict, even in situations that are relatively trivial and could easily be resolved by other means. I have made that observation repeatedly in clinical situations and the only exceptions are where the violence is driven by a psychiatric disorder. It is also obvious that learning other strategies can definitely occur often times for the worst possible reasons. An example is an aggressive man with antisocial personality disorder who typically gets what he wants by threatening or harming people. If he survives long enough, he may get to the point where that is a losing tactic and he becomes less aggressive with age. A more common example is the case of people referred to anger control groups through their contact with law enforcement or the courts. Many find that the strategies they learn in these groups are very effective. So what is the real lesson in this case? The real lesson is that this violent confrontation did not need to occur. All of the energy being expended in the debate about who was the victim and whether or not legal penalties should be assigned misses that point. It should be fairly obvious that each side can construct a detailed narrative of what happened and how that should affect the outcome. My courtroom experience has left me with the impression that it is possible that neither narrative is an entirely accurate representation of what happened. Who would want their future decided by those circumstances? All of the sensational coverage by the press misses even more widely. Solving conflicts between people by aggression and homicide is a strategy of primitive man. It arose out of a time before there was a legal system or designated police. It came from a time where there was no recognition that every person is unique and society may be less if that unique person is lost. Until there is the realization that violent confrontations are a toxic byproduct of of our prehistoric ancestors and that they are no longer necessary - there will continue to be unnecessary tragedies. Society is currently complex and aggression will never be a final solution. Coming up with better solutions at this point is the next logical step. I was fortunate enough to hear Kathleen Flenikken on my way home from an informal dinner meeting last Thursday night. In a way I was primed for for it because I had just finished a several hour discussion with another psychiatrist. We ended on a high note - the importance of maintaining your professional inspiration in an era of drudgery and manipulation. It was about an hour drive back home and I was listening to Minnesota Public Radio. Despite being the object of Saturday Night Live satire, public radio offers listeners a unique look into the consciousness of very bright people who you would never hear, see or read in more mainstream media. Ms. Flennikken is no exception. She was born and raised in Richland, Washington a city built for workers of the Hanford Nuclear Facility. She is currently the Washington State Poet Laureate. On the radio program she described her growning up in Richland as the daughter of a nuclear scientist who encouraged her interest in science. She got a degree in civil engineering and returned to the Hanford Nuclear Site to work for 8 years as a civil engineer and hydrologist. She describes an incident where she became contaminated with nuclear waste and had to be scrubbed free of that material. More importantly she describes the psychological effect that growing up in this nuclear community and then realizing in retrospect that there were problems that people were either not aware of at the time or they were not told about them. She describes the excitement of living in an "Atomic City" when she was a kid. An atom logo was everywhere including the local theatre marquis. There was an attitude within the town that the scientists, engineers, and administrators that worked there had an understanding of a complicated science. They were cutting edge. That buffered them against the outside opinion that nuclear science and industry were potentially dangerous. Hanford was previously described in the program as a site that had 8 nuclear reactors running to produce plutonium for nuclear weapons and a ninth that was used on a flexible basis for the production of plutonium or fuel for power plants. It is currently the site of an ongoing multibillion dollar clean up ever since it closed in 1986. "There is this idea out there that there are evil people doing evil things. The truth is much more dangerous. Because it's really very good people...very ethical people making lots of mistakes. There is more a lesson of truth in that than in the idea of some kind of evil doer." (At about the 10:22 mark of the audio file). That remark hit me like a bolt of lightening. Part of it was the presentation. Ms. Flenniken presents this in a very matter of fact manner. It was delivered like I imagined a civil engineer might discuss the facts. As you get older, it is obvious to most people that conflicts are a lot more complex than you thought they were when you were younger. Apart from the physical demands of the job, military recruits are more psychologically malleable for that reason. In this case, we have a person who survived a dangerous environment, but an environment that was portrayed in a different way to her community. She developed a loyalty to that community to the point that she remains conflicted today about what happened and how she should respond. The problem is captured in her remark. More generally, I think about a lot of political and professional chaos and how her analysis might apply. From unnecessary wars to stigma against the diagnosis and treatment of mental illness to ineffective advocacy - emotional biases clouding logical analysis of the situation at every step of the way. This program is also a good illustration of the power of the spoken word as opposed to the written word and how eloquent a person can be. Listen to this program and see what you think. The Story. Poetry From the Atomic City. July 11, 2013. I guess the magical thinking about how a purely political initiative with absolutely no grounding in science will affect the practice of medicine will never cease. The latest speculation is from the Journal of Clinical Psychiatry and commentary from several prominent psychiatrists (see reference) on "The Effects of the Affordable Care Act (ACA) on the Practice of Psychiatry." I know I have said this before but there is so much wrong with this piece, it is difficult to know where to start. The centerpiece like most discussions of the Affordable Care Act focuses in integrated care. I criticized the American Psychiatric Association for backing any proposal that relegates psychiatry to a peripheral supervisory position looking at so-called measurements to determine if the clinic population is "healthy" or if they need more treatment (translation = antidepressants). There is weak evidence in this article that this model will be the bonus it promises to be. Care given in the Department of Veteran's Affairs (VA) clinic is given as example of how things might be. A patient seeing multiple specialists may receive care from multiple specialists without personally having to coordinate that care. As a patient at the Mayo Clinic - it has been that way for decades. In fact, if they know you are from out of town they can frequently coordinate that care on the fly so it can all happen the same day! No patient aligned care teams necessary there. Just a good system. There was a statement about how the ACA could hurt psychiatric care of the seriously mentally ill because the states who previously paid for that care will want to bail out. The discussants point out "although the ACA plans to reimburse certain institutions for emergency inpatient psychiatric care for Medicaid patients, other evidence based practices for treating severe and persistent mental disorders are not usually covered by health insurance." Let me translate that for you. That means there will be even fewer inpatient services. The inpatient care for mental health and severe addictions takes another hit. After three decades of decimation by the managed care industry and that same industry shifting the treatment cost for these severe mental disorders to the state - we are going to pretend that nobody needs these services and continue to downsize. After all, there have been no enlightened managed care CEOs to date who decided that these services were actually important enough to adequately fund. Why would they now that they have the leverage to shift all of the money to the all important Medical Home? The idea that physicians will be paid by "value rather than volume" had me laughing out loud. I pictured the Medical Home psychiatric consultant poring over the clinic's latest batch of PHQ-9 scores and deciding which patient's antidepressants needed tweaking based on this checklist and the cryptic note of a primary care provider. Will we need more checklists for side effects and unexpected effects on the patient's conscious state? Will we need checklists for neuroleptic malignant syndrome or serotonin syndrome? What about the FDA's recent concern about arrhythmias? Cardiovascular review of systems or electrocardiogram? That will be a lot of paperwork to look over. I wonder what the consultant will be paid for delivering that level of "value". Of course all of the discussants were aware of the fact that most psychiatrists will be employees of some sort or another. Those who have not been assimilated may be in concierge practices or private practice, but good luck interfacing with the ACO. The all important technology card was played and how that should cause us all to swoon. Online or computerized therapy was mentioned. That modality has been available for over 20 years and not a single insurance company or managed care company has implemented it. Any cost benefit analysis favors an inexpensive assessment (PHQ-9 + low intensity primary care visit) and even less expensive medications prescribed as quickly as possible. The unmentioned tragedy of the electronic health record is how much psychiatric assessments have been dumbed down. The loss of information and intelligence due to the electronic health record is absolutely stunning. Phenomenological elements that require a substantial narrative or interpretation by a thinking psychiatrist are totally gone. All that is left is a template of binary elements that are important only for billing and business purposes. I suppose the lawyers might like the fact that you check the "Not suicidal" box before a patient is hurriedly discharged. Psychiatry without a narrative or a formulation or a rationale is not psychiatry at all. In the end that is what the ACA leaves us with. Ebert MH, Findling RL, Gelenberg AJ, Kane JM, Nierenberg AA, Tariot PN. The effects of the Affordable Care Act on the practice of psychiatry. J Clin Psychiatry. 2013 Apr;74(4):357-61; quiz 362. doi: 10.4088/JCP.12128co1c. PubMed PMID: 23656840. "The child with ADHD at 7 years could be seen by a child psychiatrist, but at the age of 18 often loses access to mental health services altogether, until he presents with a so-called adult mental health problem. Substance misuse and personality disorders may complicate the picture." It seems to me that practically all adult psychiatrists would not have any difficulty at all in getting a history of an earlier diagnosis of ADHD and deciding how that would be treated. I wonder if the Lancet's editors would make the same commentary on childhood asthma presenting to an Internal Medicine clinic. Would that be "so-called adult asthma"? The asthma example is instructive because it turns out that what physicians have been calling asthma for decades is more complicated than that. Recent research has adopted the endophenotype/endotype methodology that has been used to study schizophrenia. The reason why adults are seen by adult psychiatrists rather than child psychiatrists is the same reason why people stop seeing their pediatricians as adults. Treating cormorbid substance misuse and personality disorders is just a part of that reason. "The future of psychiatry looks set to change from the current model, in which ADHD, bipolar disorder, or schizophrenia are considered as totally different illnesses, to a model in which the underlying cause of a spectrum of symptoms determines the treatment." If that were true, psychiatry would have suddenly catapulted into the most scientifically advanced medical specialty because currently there is no other medical specialty that treats illness based on an underlying genetic cause. The Lancet's attached paragraph on access to services across the lifespan is accurate, but it really has nothing to do with the possible genetic revolution in psychiatric diagnosis. If the services are anywhere near as bad in the UK as they are in the United States (Is public health rationing as bad as rationing done by corporations?) there is a widespread lack of services and disproportionate rationing relative to the rest of medicine. Until psychiatrists, psychiatric services, and mental illness are destigmatized there is no reason to think that a genetic revolution will mean more access to services. The Lancet. A revolution in psychiatry. The Lancet - 1 June 2013 ( Vol. 381, Issue 9881, Page 1878 ) DOI: 10.1016/S0140-6736(13)61143-5. Hamshere ML, Stergiakouli E, Langley K, Martin J, Holmans P, Kent L, Owen MJ, Gill M, Thapar A, O'Donovan M, Craddock N. A shared polygenic contribution between childhood ADHD and adult schizophrenia. Br J Psychiatry. 2013 May 23. [Epub ahead of print] PubMed PMID: 23703318. Larsson H, Rydén E, Boman M, Långström N, Lichtenstein P, Landén M. Risk of bipolar disorder and schizophrenia in relatives of people with attention-deficit hyperactivity disorder. Br J Psychiatry. 2013 May 23. [Epub ahead of print] PubMed PMID: 23703314. Preference for Psychotherapy or General Dislike of Medication? I haven't see the study mentioned in many places yet, but there was a meta-analysis of patient preference for psychological versus pharmacological treatment of psychiatric disorders in the Journal of Clinical Psychiatry. It contained all of the usual buzzwords about evidence based medicine and why this is a hot topic to study because of the possible cost savings and potential for better outcomes if preferences were matched to actual treatments. Interestingly, in the same month a more high tech approach to matching depressed patients with pharmacotherapy versus psychotherapy came out in JAMA Psychiatry where the independent variable was a brain imaging result rather than patient preference. The authors here looked at a final sample of 34 studies out of 644 studies that were screened. They end up with a chart of effect sizes with confidence intervals for each of the 34 studies. There were a total of 90,483 participants but 78,753 were included in one study. All of the studies are of depression and anxiety. They had tried to include studies on schizophrenia and bipolar disorder and found that they were not published. The authors conclude that their meta-analysis was valid and that there was a consistent preference for psychological treatment in the treatment seeking and non-treatment seeking or recruited patients. From this the authors suggest that patient prefernce should trump other considerations if the efficacy of both treatments are equivalent. They question why medication related treatments have increased and psychological therapies have dimished over the past decade. They suggest that the patients who prefer medication related therapies are non adherent. In their discussion of the limitations of the study they find there was not enough data to compare combination therapy as a choice, they excluded non-published studies and therefore included potential publication bias, and they were not able to address the question about why psychological treatments were preferred over medication based therapies by a factor of 3:1. These and other important questions have already been answered on this blog, but don't expect to see any publications on this anytime soon. Managed care has taken the very evidence based treatments that these authors emphasize and stood them on their head. I have written many times about the diagnosis of depression using rating scales and the preferred treatment of antidepressants. If you are using a primary care physician follow up code and a PHQ-9 score result to diagnose depression in ten minutes and treat all of these patients with a generic antidepressant ($4/month) - there is no psychotherapy that compares to that low cost. All psychiatrists who are actively looking for psychotherapists to treat anxiety and depression encounter the problems of a lack of qualified therapists and more specifically a lack of therapist time in managed care systems. Managed care systems especially those that are actively managed to reduce outpatient mental health treatment has reduced available therapy in many systems to 2 or 3 sessions of crisis management and essentially limited or eliminated additional services like psychological testing that some therapists require to do their work. It is no accident that patients seeking psychological therapy can't get it. It is a conscious business decision. The second problem is the lack of availability to research proven psychotherapies. Any psychiatrist doing patient evaluations will hear the story that therapy sessions are often very non-specific, lack goals, and often result in the patient losing faith in the process and stopping the therapy. Being seen in a psychological therapy is no assurance of a good outcome. Many patients who are provided with excellent research proven therapy are frustrated with the time commitment and stop because of the cost or number of sessions. Psychotherapy may look a lot better on paper than the reality of the relationship with the therapist and the logistics of getting to and paying for the sessions. What can be done to improve the situation right now? The decision to take a medication for any reason is never a casual one. Taking that medication reliably is even more significant. Non medication alternatives and combination therapies to reduce exposure to medications should be available in every clinic. Instead of screening everyone for a medication on day one, non-medication alternatives should be presented at that time. There are innovative non-medication therapies such as computer delivered psychotherapy for depression, anxiety and obsessive compulsive disorder. No clinic appointments. The therapy is delivered online or by phone any time of the day or night. With the appropriate implementation, these therapies could be offered as first line treatment to massive numbers of patients. The human cost is so low they could essentially be made available across an entire health plan for free. There is no reason why networks of therapy clinics cannot be linked to primary care clinics who see the majority of patients with depression and anxiety. Any medication alternative can be discussed if the psychotherapy or non-medication intervention works. From a research perspective if only 34 of 644 studies were suitable for inclusion in a meta-analysis, the problem is clearly not being studied very well. I think it is important to ascertain patient preference for psychological, combination, pharmacological and other (eg. lifestyle change) therapies in all registered clinical trials. In clinical practice, it is all part of informed consent for treatment. I think it is the universal experience of physicians that most people prefer to not take medications. The negative treatment of psychiatry and psychiatric medications in the press create an understandable bias against psychiatric medications relative to others as a potential source of the described phenomenon. There is some evidence that the advertising of these medications is different and potentially stigmatizing. We also need better design of clinical trials. If therapies are in fact equivalent, they need to be tested in actual clinical populations where psychiatrists work. That includes severely ill patients with comorbidity, patients who are acutely agitated and suicidal, women and children and adolescents. Much of the discussion of equivalent therapies is based on extrapolation from populations of people who are mildly depressed and in some cases who have enrolled in a number of studies. This study highlights the current weaknesses in studying how people actually receive psychiatric treatment and how to best approach that from a research perspective. It points out that we need much better research designs and better patient selection in order to answer even basic questions about the treatment process. It should be apparent that a research design that is not adequate to describe clinical practice is not a commentary on clinical practice. McHugh RK, Whitton SW, Peckham AD, Welge JA, Otto MW. Patient preference of psychological vs pharmacological treatment of psychiatric disorders: a meta-analytic review. J Clin Psychiatry 2013; 74:6: 595-602.